French-run YAMAHA-GMT94 took the chequered flag in the famous but also grueling Bol D丹r 24hrs Endurance race this weekend, completing 801 laps on their YZF-R1 machine and beating second place by five laps. The race took place at the circuit of Magny-Cours (France) in front of 100,000 spectators; it started at 15.00 hrs on Saturday and ran through the night to finish at 15.00 hrs on Sunday afternoon. The three riders were S饕astien Gimbert, David Checa, who both also ride for YAMAHA-GMT94 in World Supersport, and Olivier Four. From the start YAMAHA-GMT94 were in the thick of the action but held their nerve to take the lead with a tight margin of 30 seconds back to second place. But, with only four hours to go the second placed Suzuki team crashed out, giving YAMAHA-GMT94 a ten lap lead. Keen to avoid anything that could lose them the lead, the team maintained their focus to take the win. This win is made all the sweeter as this is their first win at the Magny-Cours race. Permanent World Endurance Championship entry YAMAHA PHASE ONE ENDURANCE team finished fourth (with riders Warwich Nowland, Glen Richards and Pedro Valcaneras Flores) with Yamaha teams ACROPOLIS MOTO EXPERT fifth and ENDURANCE MOTO 38 finishing seventh. 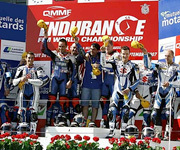 Currently 4 Yamaha teams are in the top 7 of the Endurance World Championship standings. YAMAHA-GMT94, run by former rider and passionate sportsman Christophe Guyot, operate on a strategy focused on two different race programs. They are permanent entries in the World Supersport Championship with riders David Checa and S饕astien Gimbert mounted on Yamaha R6 machinery. In addition, they enter the two most demanding Endurance races in the world on the Yamaha R1, both run in France - the Le Mans 24hrs and the Bol d丹r 24hrs.